Octoberfest or properly in German, “Oktoberfest” is a 16-day long celebration, which is strongly associated with German culture, bratwurst of every kind, lederhosen, and of course, beer gardens. Although, it’s named Octoberfest, the celebration of the event actually begins at the end of September and runs into October. While the most famous celebrations are in Germany, there are notable festivals around the world that have taken up the tradition of celebrating this German holiday. 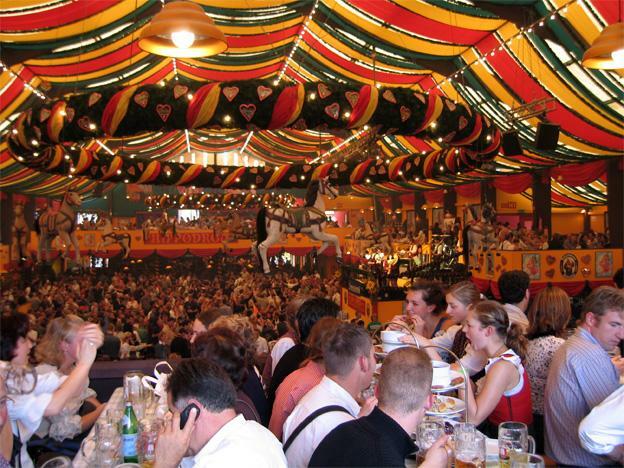 It isn’t Octoberfest until you’ve visited the “Oktoberfest” that’s the granddaddy of them all in Munich, Germany. The annual festival, held every year in Germany’s Bavarian region, had its beginnings in 1810. It celebrated the marriage of King Ludwig the 1st to Princess Therese of Bavaria. In a grand gesture toward the citizens of Munich, everyone in town was invited to share in the royal wedding celebrations and the townsfolk spent days dancing at the city’s gates. Initial celebrations of the event included a horse race and several years later, an agricultural festival. In Munich, a 12-gun salute kicks off the opening of the beer taps and the beginning of the celebration. Find the original “Oktoberfest” on the web at [http://www.oktoberfest.de/en/]. For those who can’t quite make it to Germany for the Octoberfest celebration, Leavenworth, Washington offers a good substitute. This Bavarian-flavored town also rings in the annual German holiday. However, in keeping with a more American view of the event, it begins its celebrations in October proper. It provides shuttle service to and from events, has lots of entertainment, family fun, souvenirs like beer mugs, and naturally, beer just like in old Germany. Despite being outside of Germany, the town has an Alpine feel and plenty of German architecture. For more information, look on the festival’s website [http://www.leavenworthoktoberfest.com/index.html]. The Mount Angel, Oregon Octoberfest is also a celebration taking place in the western United States. It won a 2012 medal for “Best Annual Event” in the Mid-Valley, and it features not only the requisite beer tasting, but also arts and crafts fairs, live music, and a kindergarten with rides and shows. It was originally settled by German pioneers, and begin its Octoberfest in 1966 as a way to celebrate the heritage, harvest tradition, and “the goodness of creation,” according to the town’s Octoberfest website. It’s a September festival, so for the Octoberfest enthusiasts living in the West, it’s possible to hit a festival like this and then move on to other festivals like Leavenworth as well. Read more about the Mount Angel Octoberfest on the web at [http://www.oktoberfest.org/]. Just about an hour outside of San Antonio, the town of Fredricksburg, Texas celebrates its strong German cultural heritage every fall. Its Octoberfest runs through the first weeks of October traditionally. There are also activities for kids, concerts, a beer tent, arts and crafts, and even a chicken dance in the square. But besides the abundance of beer, this festival offers an enviable menu of German food. One could eat breakfast, lunch, and dinner at this festival and probably still never eat all of the good food the place has to offer. And for those who might be worried about how the fall weather will affect the celebration, this town festival promises that the show will go on rain or shine! Catch up with this Texas festival at [http://www.oktoberfestinfbg.com/]. For 40 years, the town of Seymour has celebrated Octoberfest with the best of them. There’s flea marketing selling items that people can’t possibly live without, hot air balloon races, a talent contest, baked goods competition, cloggers, dancers, and many other types of celebratory goodies to help mark this Ode-to-German-culture in the Midwest. It’s also an October celebration, making it a nice way for Midwesterners to kick off the fall season in grand German style. Find out more about the festival at [http://www.seymouroktoberfest.com/]. While it may be a dream to spend Octoberfest in Germany, the land of the celebration’s birth, there are plenty of festivals around the country that boast great celebrations. They take place all over the country, ensuring that a good celebration is little more than a couple of hours away from wherever a person lives. Thanks to the will of the German settlers and a love of a good celebration, this traditional German festival is alive and well in both Europe and the U.S.